As we reported on unifor4000.com on September 12 and September 14, 2016, CN filed an application to the Canada Industrial Relations Board (CIRB) against Unifor for a 'Declaration of Illegal Strike' and an 'Order to Cease and Desist' pursuant to Sections 89 and 91 of the Canada Labour Code after a number of CNTL Owner-Operators based in Calgary, Alberta made themselves unavailable for service on September 11, 12 and 13. 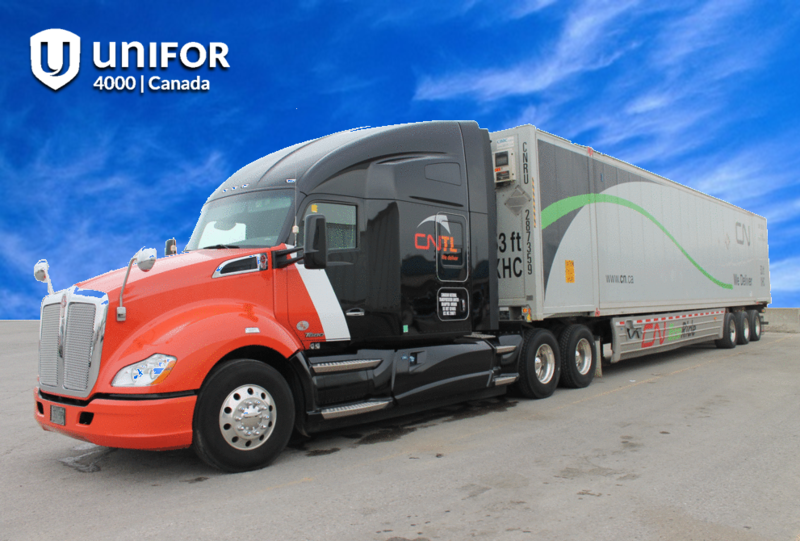 Members were frustrated over a number issues, among them, CNTL Owner-Operators from Kamloops and Vancouver, B.C. being dispatched to more lucrative highway runs, and the ongoing disrespect shown to them by CNTL management and dispatchers. The CIRB conducted a hearing by teleconference on September 13 between the Union, legal counsel and senior management of CN and the Regional Director and Chairperson of the CIRB. Following this 21-minute teleconference, immediately the Board issued an Order for CNTL Calgary Owner-Operators to cease and desist from participating in any strike activities and immediately report for work. Unifor National Council 4000 President Barry Kennedy wrote to CN Labour Relations requesting a meeting with senior CN and CNTL officials to discuss the various concerns and complaints that have been raised by the Unifor membership leading up to these events. A meeting was held on September 21, 2016 at which time the Union presented a 3-page list of concerns. CN and CNTL took these concerns serious and have committed to reviewing them and taking necessary action where required. Several issues have already been addressed and being implemented. But the Company (CN and CNTL), who despite saying that they want to put this matter behind us, nevertheless want to point out to those Owner-Operators involved in the actions of September 11, 12 and 13, that it was a serious breach of the CNTL/Unifor Collective Agreement and the Canada Labour Code and could negatively impact CN's and CNTL's operations. Therefore, they will assess sanctions against those members involved. The Union held significant discussions with CN in hopes of alleviating the requirement of investigative hearings and excessive disciplinary measures. These discussions lead to a voluntary 'Amnesty Agreement' being offered by CN following our negotiations. But members are not obligated to sign this agreement, and may instead, appear for an investigative hearing in relation to their absences as in accordance Article 8.4 of the collective agreement. Members may be subject to the disciplinary measures set out in Articles 8.1 and 8.2 of the collective agreement, but may appeal any imposition of discipline by way of the grievance procedure outlined in the collective agreement. Tap here to read the communique issued to our membership by Council 4000 President Barry Kennedy that explains more and contains a copy of the Amnesty Agreement being offered by CN.